As the end 2009, Indonesia’s proven reserves of oil were 4.4 billion barrels or 0.3% of the world reserves. Production was 1021 thousand barrels daily. In 2001, the new Oil and Gas Law No. 22/2001 was passed, which relinquished Stated-owned oil company Pertamina of its role in granting new oil development licenses and limited the company’s monopoly in upstream activities. The regulatory and administrative functions of Pertamina were also transferred to a new regulatory body called Badan Pelaksanaan Minyak Gas, or BP Migas. BP Migas and the Indonesian Government have introduced new policies to increase foreign investment in the country’s upstream sector. Indonesia left the Organization of Petroleum Exporting Countries (OPEC) in 2004. The productive oil fields of Indonesia are mainly located in the central and western sections of the country. Over the years, production has been declining, with companies extracting oil from existing fields attempting to increase recovery rates and to prolong the life of the fields. New exploration works are now concentrated in the frontier regions of the country, especially in the pre-tertiary basins in the east. Chevron, which control Caltex Pacific, is the largest oil producer in Indonesia. Other major players are BP, ConocoPhillips, ExxonMobil, Total, as well as China’s state owned companies PetroChina and China National Offshore Oil Corporation (CNOOC). Indonesia operates seven refineries with the largest being the 348 000 bbl/d Cilacap in Central Java, the 240 920 bbl/d BalikPapan in Kalimantan and the 125 000 bbl/d Balongan in Java. PT Kilang Minyak Intan Nusantara, a joint venture of Al-Banader International Group of Saudi Arabia (40%), China National Electrical Equipment Corporation (40%) and PT Intanjaya Agromegah Abadi (20%), also operates a refinery in Pare-Pare, South Sulawesi and in the Batam Island, Riau. Both projects have refining capacities of 300 000 bbl/d. Inputs to the refineries are crude oil from Saudi Arabia, with outputs exported primarily to the Chinese market. The 2010 BP Statistical Energy Survey states that in 2009, Indonesia proved natural gas reserves of 3.18 trillion cubic metres, 1.69% of the world total. Indonesia had 2009 natural gas production of 71.93 billion cubic metres, 2.4% of the world total. 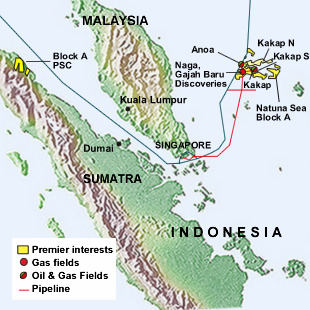 In 2010, Indonesia’s Ministry of Energy and Mineral Resources signed a decree to build two gas pipelines from Natuna as part of its master plan for the domestic distribution. Having a capacity of one billion cubic feet of gas a day, one of the pipelines will be 740 kilometres long, linking Natuna to Batam Island and Duri in Riau. Another pipeline will connect Natuna with Kalimantan. Also being planned is an extension of the existing 755 kilometres pipeline (connecting Banjarmasin, Palangkaraya and Pontianak; all in Kalimantan) to Natuna. The US-based Energy Information Association has reported that Indonesia’s gas exports have dropped due to allegations of lack of transparency in regulations, inadequate infrastructure and unfavorable PSC terms undermining investment support. In late 2010, Chevron Corporation announced the award of major front-end engineering and design contracts for its Gendalo-Gehem natural project in East Kalimantan. The project will include two separate hub developments, each with its own floating production unit (FPU), subsea drill centres, export gas and condensate pipelines and an onshore receiving facility. The contract for the FPUs was awarded to PT Technip Indonesia; the contract for the subsea and flowline system to PT Worley Parsons Indonesia; the contract for the export pipelines to PT Worley Parsons Indonesia; and the contract for the onshore receiving facility to PT Gas from the project will be used both domestically and also converted to liquefied natural gas (LNG) at the Bontang LNG facility in East Kalimantan. Maximum daily production from the project is expected to be 1.1 billion cubic feet of natural gas and 31 000 barrels of condensate. 8 Mini LNG Terminal to be operated in Balikpapan, East Kalimantan, Southeast Sulawesi and Bali by 2015.